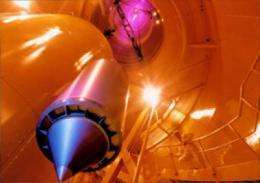 (PhysOrg.com) -- A sensitive measuring device must not be dropped - because this usually destroys the precision of the instrument. A team of researchers including scientists from the Max Planck Institute of Quantum Optics has done exactly this, however. And the researchers want to use this experience to make the measuring instrument even more sensitive. The team, headed by physicists from the University of Hanover, dropped a piece of apparatus, in which they generated a weightless Bose-Einstein condensate (BEC), to the bottom of a drop tower at the University of Bremen. The particles in a BEC lose their individuality and can be considered to be a 'super-particle'. The researchers want to use such an ultra-cold quantum gas at zero gravity to construct a very sensitive measuring device for the Earth's gravitational field - in order to find deposits of minerals, and also to settle fundamental issues in physics (Science, June 18, 2010). In a vacuum, a feather falls as quickly as a lead ball - something that is already presented to students as being irrefutable. "However, the equivalence principle is only a postulate that needs to be tested," says Ernst Maria Rasel, professor at the University of Hanover. According to the equivalence principle, the heavy mass with which bodies attract each other corresponds to the inertial mass, which resists an accelerating force. This means that in a vacuum all bodies hit the ground with the same speed. Physicists want to use a measuring device that measures gravity extremely accurately to investigate whether this hypothesis can really become a physical law. Ernst Maria Rasel's team has now taken an initial step in this direction. The researchers generated a Bose-Einstein condensate (BEC) in zero gravity and observed, for more than a second, how the atomic cloud behaves in free fall. 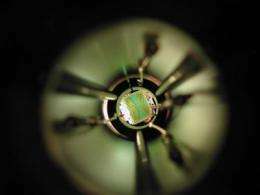 To this end, they installed an atom chip developed by researchers working with Theodor W. Hänsch, Director at the Max Planck Institute of Quantum Optics, and solenoids, lasers, a camera and the necessary energy supply into a cylindrical capsule, which is about as high and wide as a door. After they had moved a cloud of several million rubidium atoms onto the atom chip, they dropped the complete apparatus 146 metres into the depths. A tower at the Center of Applied Space Technology and Microgravity of the University of Bremen specializes in such scientific cases. As the capsule was falling to the ground for four seconds in the drop tower, the researchers generated the BEC on the atom chip, initially by remote control: strong magnetic fields and lasers hold the particles on the chip and cool them. At a few millionths of a degree above absolute zero, the temperature at minus 273.16 degrees Celsius, the particles have lost almost all of their energy and assume a new physical state: all atoms are now in the quantum mechanical ground state so that they can no longer be distinguished as individual particles in the quantum gas. "They behave completely coherently, practically like a heap of atoms that assumes the properties of a single huge atom," says Tilo Steinmetz, who was involved in the experiment as a researcher from the Max Planck Institute of Quantum Optics. Since the laws of quantum mechanics say that every particle can also be considered to be a wave, it is possible to describe what is happening in a different way: A wave packet of matter forms in which the atoms no longer stay at fixed locations - they are delocalized. This grouping is maintained until an energetic push, however small, mixes it up. "We generate a BEC in less than a second on our atom chip. With conventional laboratory apparatus, this takes up to one minute," says Tilo Steinmetz. In addition, an experiment on an atom chip requires significantly less electrical power. "It is thus ideal for use in a drop tower capsule, where energy supply and cooling present a logistical challenge," says Steinmetz. As soon as the atoms on the chip had merged into the super-particle, the researchers carefully loosened the hold of the trap and released the BEC. The camera in the capsule now enabled them to observe how the condensate spread. This movement reacts extremely sensitively to external fields - to differences in Earth's gravitational field, for example. These differences exist because the gravitation at a certain point on Earth depends on the local density of the Earth's crust. The longer the Bose-Einstein condensate expands, i.e. the longer it floats in zero gravity, the clearer these differences make themselves felt as it expands. With the experiment in the drop tower alone, the researchers extended the time available for a measurement by more than tenfold when compared to a laboratory experiment. This could help in the future to drastically improve the accuracy of measurement data. The differences can be measured in an atom interferometer: A quantum gas, that is the wave-packet of matter, is split into two parts and moves in the gravitational field along different paths through space-time. Gravitation behaves like an optical medium, whose refractive index refracts the waves. As soon as the two parts reunite, there is interference, as is also generated when waves on a water surface run into each other. The interference pattern depends on how differently the two matter waves expand. If matter waves of different composition are compared, a test of the equivalence principle with matter waves is performed. The physicists in Ernst Maria Rasel's group now want to construct such an atom interferometer for the capsule of the Bremen drop tower. "Ultimately, we would like to perform such experiments in space," says Ernst Maria Rasel. The equivalence principle could also be tested there. To this end, the researchers must drop clouds of different atoms to Earth for as long as possible. They could then find out whether all bodies really fall with the same speed. And the longer the atom clouds remain in zero gravity - that is, the further they fall - the more chance there is of clarifying this. Does weak equivalence break down at the quantum level? okay, the project is really really cool, but could the writers for these articles please stay consistent!? Free-fall is not the same as zero gravity, so it should consistently say free-fall throughout the entire article. According to the equivalence principle in Einstein's theory of General Relativity, free fall and zero gravity are indistinguishable as acceleration due to inertia and acceleration due to gravity are identical. The experiment they've set out is to test that principle. Technically speaking, the writer is being consistent. Not quite. Not every point in the spacecraft experiences the same pull of gravity from Earth. Even at such scales the (possibly tiny) differences in distance from Earth's centre-mass causes gravity to be slightly different. There is an experimental difference between a zero gravity environment and one in free-fall. Hence the reason why the term "micro-gravity" is preferred to "zero gravity". If you take 2 tennis balls, a couple of meters apart a few hundred miles above the earths surface and let them go, they will start to fall under gravity, free fall. As they fall, each is "pulled" towards the centre of the earth. As they get closer to earth you would notice the distance between the 2 balls starting to reduce. (as if falling down an invisible cone)indeed if they could eventually reach the centre of Earth they would touch. (ignoring air resistance of course) each ball on its own would not be able to distinguish from Zero G but the system its self is easily distinguishable from Zero G. In Zero G the balls would very slowly move towards each other under minute but mutual gravitational attraction. I think free fall & Gravity are thus easily distinguishable. In my opinion the difference of the gravitational pull from the Earth between 146 meters is so small that it cannot even be measured, so free fall and zero gravity is the same thing in that experiment. Of course theoretically the hole thing changes. Believe it or not, your instinct is incorrect. There are very apparent differences between a system at free fall and a system subject to zero gravity. First off 146m difference in distance from Earth at Low Earth Orbital distances is a difference of about 0.005% of the gravity. That is quite measurable. Also, it's not merely the pull of gravity that matters, but the orbital differences of objects of different altitudes and orbital planes. "Floating" objects in a spacecraft in LEO are actually in independent orbits around the Earth. If two objects are placed side-by-side (relative to their direction of motion) they will be orbiting the Earth in different orbital planes. Since all orbital planes pass through the center of the earth, any two orbital planes intersect along a line. Therefore two objects placed side-by-side (at any distance apart) will come together after one quarter of a revolution. Note: One quarter revolution is about 15 min for the orbits of the shuttle or ISS. If they are placed one ahead of the other in the same orbital plane, they will maintain their separation. If they are placed one above the other (at different radii from the center of the earth) they will have different potential energies, so the size, eccentricity, and period of their orbits will be different, causing them to move in a complex looping pattern relative to each other. As you can see, a system in free fall is considerably different from one which experiences no gravity. Wouldn't the balls separate out, as the lower one is pulled by greater gravity? If we could make a twin beam of coherent matter, it should be able to be sensitive to gravitational waves. I was describing two balls horizontally side by side, rather than vertically seperated. (It was sloppy of me not to specify that initial state). But if they were vertically seperated then yes you would get the "Spagetification" type of effect as the lower ball would "feel" slightly more g. Indeed the atoms in the same horizontal plane in the ball would tend move closer together and those in the vertical "pulled" apart. I immagine everything falling down a cone. There's definatley a big difference between a system in zero g and one in free-fall in my mind. "We generate a BEC in less than a second on our atom chip. With conventional laboratory apparatus, this takes up to one minute,"
So, anybody else find this part really interesting? Although, admittedly, i'm not entirely sure what else a BEC could be used for in computing. I'm sure someone will find an interesting use for one in computing. And there will probably still be a non-computing friendly size issue in order to keep that cool "super-atom" cool anyway...not enough information on the new system presently. I see the difference. I had never thought of objects orbiting the Earth while free falling indeed. It's quite interesting and it changes the whole picture. But in this experiment does all this matter? I mean the time of the fall, and the heigh and the orbit of the BEC, are they worth taking on account?